With Thanksgiving just two weeks away, we’ve teamed up with Chef Jodi Moreno of What’s Cooking Good Looking to bring you two perfect (and easy!) 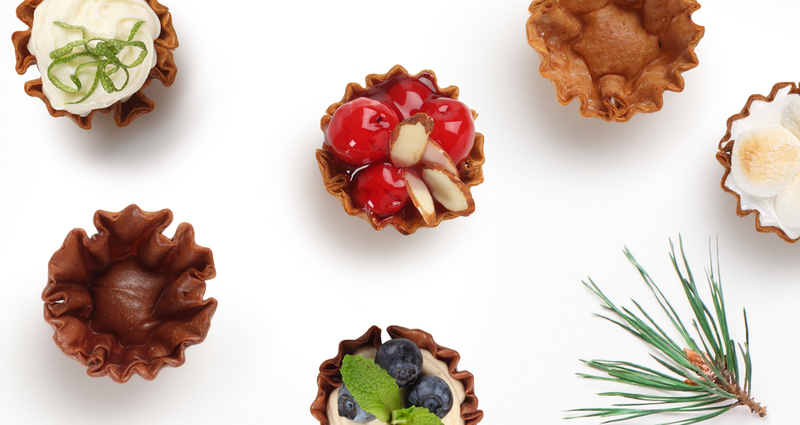 desserts that will impress all of your family, and friends, this holiday season. 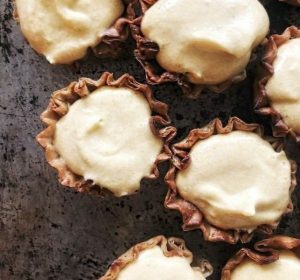 Calling for Athens Foods’ newest phyllo shell flavors, these Pumpkin Cheesecake with Graham Cracker Phyllo Shells and Chocolate Almond Butter Cups in Chocolate Phyllo Shells will easily be crowd favorites on the dessert menu. “Phyllo shells can make you feel like an entertaining superstar. It’s the secret to super tasty, but also super easy-to-make desserts that can easily feed a crowd and can often be made in advance,” Chef Moreno said. Each recipe below yields 45 phyllo shells. Place all of the ingredients into a food processor and process until very smooth. Using a small teaspoon, spoon the mixture into the graham phyllo shells. Either serve immediately, or keep in the fridge or freezer until you’re ready to serve. If keeping in the freezer, be sure to allow them to sit at room temperature for 10 minutes before serving. Melt the chocolate over a double boiler. Spoon about ½ teaspoon of the chocolate into each shell. Allow them to sit on the counter at room temperature while you make the nut butter mixture and keep the remaining chocolate in the double broiler. Mix the almond butter, honey, and powdered sugar together in a small bowl. Then, take about ½ teaspoon of the mixture and roll it between the palm of your hands to form a ball, and then place it into the shell on top of the chocolate. Do this until each shell has been filled with the nut butter mixture. Lastly, reheat the remaining chocolate that was left in the double boiler. Spoon another ½ teaspoon on over the nut butter, being careful not to overfill. 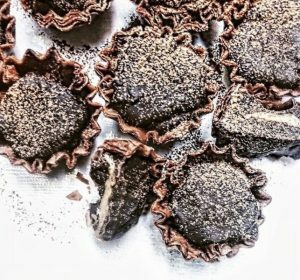 Finish with a sprinkle of flaky sea salt on top, and then place it in the fridge or freezer until the chocolate has hardened. These are best served slightly chilled. 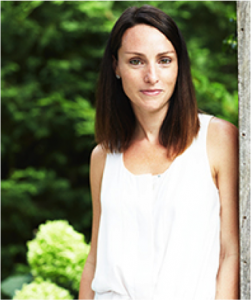 Jodi Moreno is a NYC-based recipe developer, food stylist, and cookbook author. She writes a popular recipe blog called What’s Cooking Good Looking that has been named twice by Saveur Magazine as best overall cooking blog. Her work has also been featured by Vogue, Bon Appétit, Jamie Oliver Magazine, and many more. Jodi is also the co-owner of Neighborhood Studio in Brooklyn, NY, which is a test kitchen and photo studio by day, and home to community dinners, cooking classes and various workshops & events on weekend nights.